In the last few days, I have met Manari Ushigua of the Sápara people (‘Zapara’) of Pastaza Province in the upper Amazon forest of Ecuador. 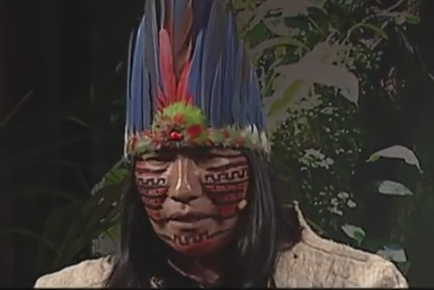 Formerly vice-president of the Confederation of all the Indigenous Nationalities of Ecuador (CONAIE), Manari is currently Sápara president of the Bi-National Sápara Federation of Ecuador and Peru. Some 575 Sápara people now live on what is left of their ancestral lands. Only seven individuals, Manari included, continue to speak the Sápara language, which was proclaimed by UNESCO in 2001 as a ‘Masterpiece of the Oral and Intangible Heritage of Mankind‘. These remaining Sápara are struggling to retain their land, as well as the integrity of the forest that is their home, in the face of enormous pressure for the extraction of oil from the ground underneath Sápara territory. Sápara legally own their land, and Ecuador has appeared to be a leading light on environmental issues due to its constitutional recoginition of the ‘Rights of Nature‘. Nonetheless, the Ecuadorean government claims rights to below-ground fuels and minerals, and has now commissioned blocks of these rights under Sápara and other indigenous territories to international oil corporations. (left) Sapara territory, Pastaza Province, Ecuador; (right) oil block concessions in east Ecuador, including Sápara territory (in dark red). Click to enlarge. 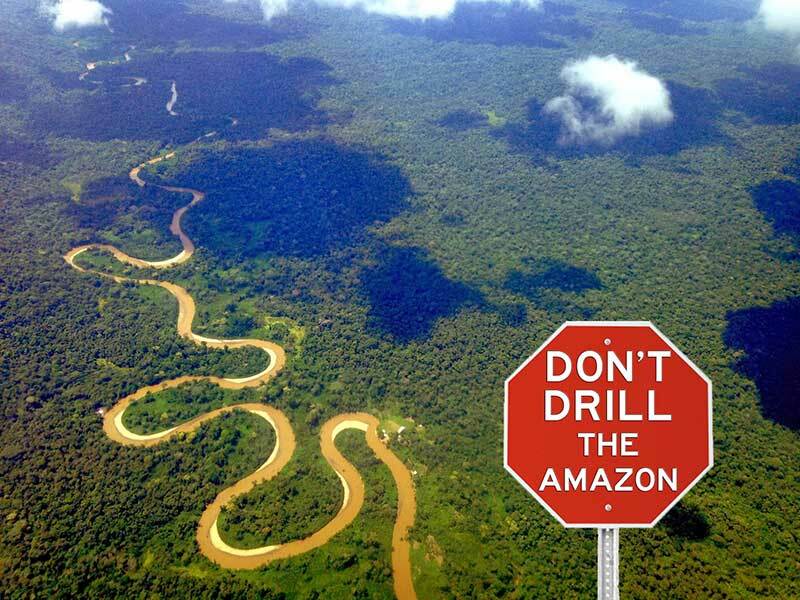 As described by the Pachamama Alliance – an organisation that works with Ecuadorean and Peruvian indigenous peoples to protect Amazonian land and livelihoods against extractive industry: ‘two years ago the Ecuadorian government announced plans for oil development in this region. This past year , a development concession to two blocks of land, approximately 500,000 acres, was assigned to a Chinese oil company. These blocks, in Sápara territory, represent a gateway into the entire South-Central region’. This is a tragic situation for multiple reasons. Of immediate concern is the imminent destruction of the biocultural diversity embodied by the interconnected cultural and natural diversity of the forest in this geographical space. The south-central Amazonian area of Ecuador is considered by ecologists to be amongst the most biodiverse localities on the planet. And the loss of language and indigenous knowledge regarding this diversity is surely as impermissible as the loss of species with which these cultural elements are entangled. To step for a moment into Sápara cosmology, however, is to see a broader tragedy caused by industrial hunger for the potent minerals fuelling contemporary economic and technological growth. Manari spoke of there being spirits deep in the earth associated with the oil found there. These spirits, which confer vitality to oil, nourish spirits around five metres below the surface of the soil, which in turn animate the roots of plants that burst through the surface of the soil to provide food and habitat to animals and humans dwelling above the earth’s surface. In this spirited understanding of the connected nature of being – in which mineral, plant and animal-human entities are all alive and in relations of nourishment with each other – extraction of the earth’s potent below-ground materials engenders imbalance in the lifeforce of the connected entities above ground. This perspective affirms that the zone of life on earth referred to as the ‘biosphere‘ by environmental scientists, is intractably entwined with minerals found deep in the earth. In other words, that above-ground socio-ecological health and diversity is connected with the spirited liveliness of intact below-ground fluids and minerals. There are echoes of this perception in many other cultural contexts. U’wa people of Columbia understand oil as the blood of a feminine mothering earth. In the late 1990s they threatened collective suicide in protest aginst the affront of oil exploitation by the US-based corporation, Occidental Petroleum. American Indian Movement activist John Trudell describes another potent mineral – uranium – as having being and spirit; as nothing less than the DNA of the earth, for which an industrial mining-refinement process creates a mutated form of power that ultimately is toxic to life. I cannot claim to know whether or not these perspectives are ‘the Truth’. But they certainly cast our current environmental predicament in a particular light. They suggest that the effects of pulling fuel and minerals out of the earth may be more unpredictable, mysterious and far-reaching than the echoes of a post-Enlightenment mechanistic worldview is able to register. They give weight to a view that the holes in the earth created through mining processes, coupled with changes in atmospheric composition caused by pumping these elements into the layer of gases permitting life to thrive on earth, are causing sickness in the living, breathing body of the earth itself. Indeed, science increasingly recognises this moment as the ‘Anthropocene‘: a geological epoch in which humans have achieved the dubious honour of becoming the key planetary force shaping our world. A defining part of this epoch is an extinction event that may also take with it Homo sapiens sapiens. Given what seems to be an apocalyptic moment, it seems relevant – perhaps even imperative – to be curious about how different cultures globally have understood their relations with nature-beyond-the-human: particularly where an ability to live with multiple kinds of selves is apparent in the diversity of species with which such cultures are associated. In other words, to learn of knowledges and practices that have acted as checks on the instrumental, industrial and ownership practices that tend instead to be destructive of such diversity. Of course, there is complexity here. Manari flew to the UK using the substance whose exploitation threatens his people with extinction. We are all caught within the web of industrial-techno-capitalism in ways that make it impossible to fully shrug off our culpability in systemic planetary changes that many consider are drawing us towards broad spectrum catastrophe. This seems to be a critical challenge for our times. To sit with compassion for our own accountability for the losses now occurring; whilst acting for the possibility of systemic change that prevents these losses. To face what can seem to be the impossibility of reorienting the global compass bearing away from financial profit and economic growth; so as to keep hope alive for a systemic re-orientation towards equitable socio-ecological relationships that give space for the flourishing of the spirit that animates all beings. It will be incredibly sad, not to mention idiotic, for a species with such extraordinary intelligence, sensitivity and potential for poetic connection with selves beyond-the-human, to fail at nourishing ourselves and our companions here on earth because we’ve forgotton that this is possible. Charges of romanticism and naivety frequently negate the value of connecting with and learning from the different perceptual realities of people who retain ancestral cultural links with landscapes. But listening to and sharing with individuals such as Manari seems key to learning that the quality of assumed reality, and of the ethical actions that flow from this, is not fixed. As invoked by John Trudell in the poem below, it might be possible to choose different sorts of socio-ecological futures, if we acknowledge and remember the existence of different kinds of pasts. How we see what we see, affects the quality of our reality. We are in time and space, but we are beyond time and space. The past is part of the present. The future is part of the present. Life and being are interwoven. We are the DNA of earth, moon, planets, stars. We are related to the universal. Spirit and intelligence with clarity. Being and human as power. We are part of the generations of evolution. We are part of the memories. These memories carry knowledge. These memories carry our identity. Beneath race, gender, class, age. Beneath citizen, business, state, religion. Manari travelled to the UK through the support of the Pachamama Alliance and the School of Movement Medicine. See ‘Reasons for Hope and Action‘ by Susannah Darling Kahn for more detail. ‘They’re mining us’, John Trudell, Descendants Now Ancestors, 2001, ASITIS Productions. after Kohn, E. 2013 How Forests Think: Towards an Anthropology Beyond the Human. Los Angeles: University of California Press. ‘Of many realities’, John Trudell, Descendants Now Ancestors, 2001, ASITIS Productions. Sápara people are working towards alternative and sustainable development possibilities on their land through the Naku project, a community ecotourism initiative that seeks to support Sápara culture and the biodiversity of their territory, through sharing their perspectives on the natural and spirit worlds. The Pachamama Alliance seeks to stand with indigenous peoples of the Amazon to protect the forest from extractive industry whilst also working through education and the Pachamama Symposium to shift the worldview fueling environmental and cultural destruction. These initiatives can be supported at the links above. Next Three of Namibia’s most famous lion family were poisoned – why? As we sort out differences between the wisdom of humanity’s worldwide ‘indigenous’ (Latin ‘self-generating’) ancient abundant, peaceful heritage & the ignorance of violent colonial greed s rudely imposed. For guidance, we can turn to the original responses by 1st Nations to the European economic-ecological colonial refugees who arrived from Europe’s war-torn destroyed nations. 1st Nations welcomed the refugees as was once the culture of all indigenous peoples on earth. The refugees were made to feel welcomed & by 1700 AD, most were integrating into the Quipu based string-shell accounting & Production-Society/Guilds specialized organization of diverse domestic, industry & commerce labour economies. 1st Nations could see the isolation, subservience, hierarchy & bullying part of the settlers & Mestizo, but were confident settlers would learn.